Your pitch to film investors might be your one opportunity to land the coveted prize...a film investment check! You've prepared for and found film investors. They were excited to learn about your offer via the compelling business plan you wrote and now, you actually have a meeting scheduled. Do you know what to say and how to say it so investors don't feel pressure, but rather, want to write you a check? Are you using every possible tool in your arsenal to get your film financed? Here are some basic steps to help you find investors, set the meeting to pitch to film investors and get them to commit. 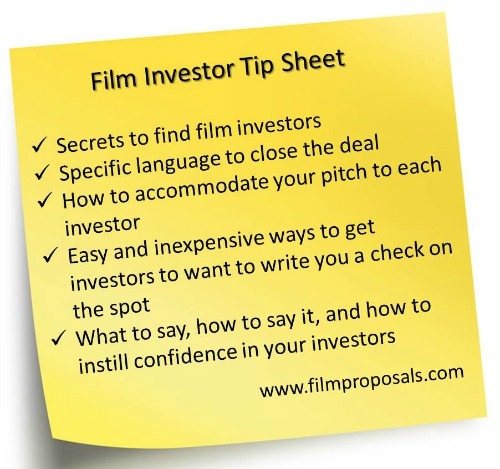 For details, and to unlock the true secrets to securing Film Investors, check out our Film Investor Tip Sheet. Our Film Investor Tip Sheet includes practical tips, real world examples and proven fundraising language for every point above. You can never be too prepared when making your pitch and document to potential investors. Do you know the best ways to pitch to a left-brain person vs. a right-brain one? Do you know one specific thing you can do for almost no money that immediately creates the Executive Producer vision in the investor's mind..and makes them want it? Avoid the worst thing you can do with investors that will shred their confidence in you in a split second. We do not want our secrets to pitching film investors getting out to everyone. Only those very serious about making their films have access to our film investor tips and tricks. Find out more about how to download our Film Investor Tip Sheet, compiled from leading industry film financiers.